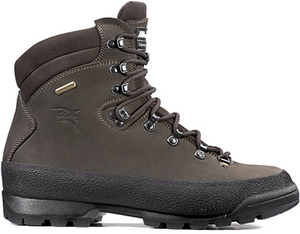 The Mondeox Tonale Fas OX 3 heavyweight hiking boots reflect Italian design and rugged waterproof breathable construction. The leather upper is buffeted by a full rubber rand for added durability, and a stiffened midsole offers firm support on rugged trails and long treks. The new OX Comfort insole guarantees a high level of breathability and excellent shock-absorbing effect especially in the heel zone for total comfort at every use. The Vibram® Andermat 1032 lugged rubber outsole excels in technical terrain.